My cousin and his wife are expecting their first baby and, knowing that their baby shower would probably land right in the middle of our move, I made this quilt a few weeks ago. I have a LOT of cousins - somewhere in the 40-50 range - plus my husband has at least as many as I do, so there is no way I could make a quilt for each of my cousin's babies. I am closest with my cousins on my mom's side, so I decided that I would make a quilt for each of their first babies. So far only a couple of them have kids, but there are probably a lot of baby quilts in my future. 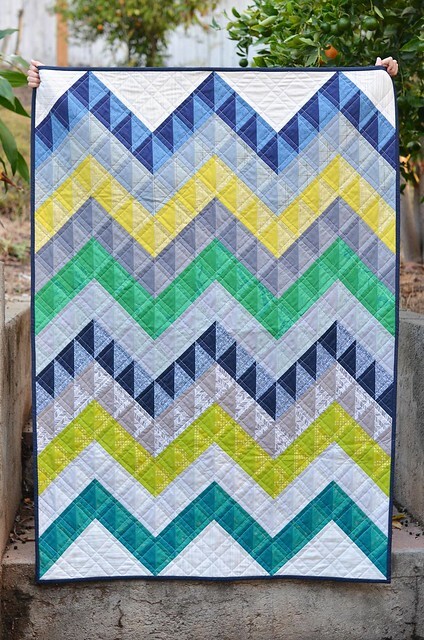 They wanted a quilt that used navy and lime. I hope they don't mind that I took a little liberty with that because I have virtually no lime fabrics in my stash. I ended up adding some other greens, blues and yellows as well as a whole bunch of grays. This quilt could also be called "Ode to Carolyn Friedlander." Sometimes a designer makes fabrics that are just in the right colors for a project, and that was the case for this quilt. This quilt ended up 38" x 51" and was made using a whole bunch of 3" finished HSTs. The backing is a Mama Said Sew print that I've had in my stash for a while. This quilt was gifted this past weekend and I am excited that I can finally share it with you. p.s. Thank you for all of your kind comments on our house. We had an open house this weekend and 90 people showed up. Crazy! I am hoping we can accept an offer soon that I can stop spending my entire day cleaning! 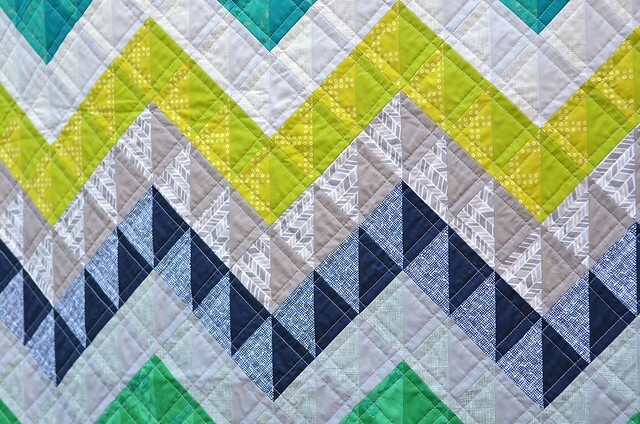 What a clever new spin on HSTs and Chevron. The colours are perfect, I don't think this would have looked quite this amazing with only lime and navy. Good look on the house sale. I had a look at the pictures and I'm not surprised so many people showed up! 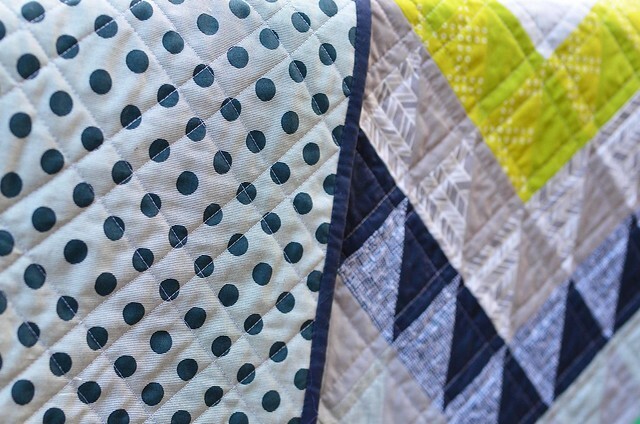 I would never have thought of doing a quilt this way but it looks amazing. Your house is beautiful and I can't imagine that it wouldn't sell very quickly. So nice! 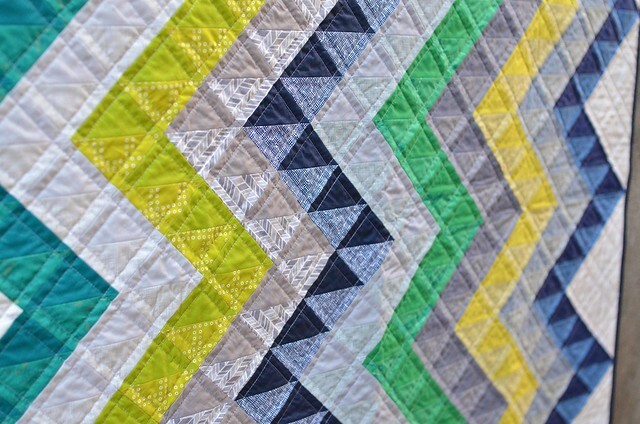 The alternating color values in the chevrons really really give this quilt character. Beautiful quilt! I am sure your cousin and his family will enjoy it! Hope you have a great offer on the house soon! Beautiful. Your use of color in your design makes it very striking! I haven't seen HSTs used like this before and it is a stunning result! Wow, you are brave AND creative! It is the perfect crib quilt size! What a great quilt! Colors, hst, and design!